Stratford’s latest production of the much-loved musical Fiddler on the Roof is sturdy, solid and in no way innovative – and that’s probably how most people would want it. It is superior in almost every way to Stratford’s overblown production of Fiddler in 2000 except one. The 2000 Fiddler had Brent Carver in a revelatory performance as Tevye. 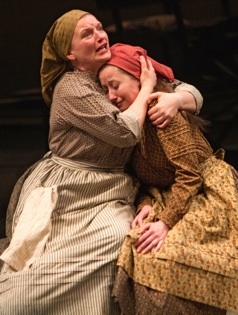 The 2013 Fiddler has Scott Wentworth in a performance that director Donna Feore seems determined to keep as clichéd as possible. In the 1964 musical based on the stories of Sholem Aleichem, Tevye is a poor milkman who lives with his wife Golde and five daughters in the village of Anatevka in 1905 Russia. What keeps life in balance for the people of Anatevka is their Jewish faith and their belief in tradition as the opening number “Tradition” makes clear. Times, however, are changing and Tevye has to face an increasing worse series of blows to his beliefs. The oldest of his three daughters all choose their husbands themselves rather than using a matchmaker. The oldest, Tzeitel, marries a poor tailor rather than the rich butcher the matchmaker has arranged for her. The next oldest, Hodel, falls in love with a political revolutionary from Kiev. And the third, Chava, causes the worst breach of all by marrying out of the faith. At the same time as Tevye suffers these infringements against tradition within his own family, Tsarist Russia had sanctioned pogrom against Jews involving violence, death and expulsion from the land. Throughout the musical the devout Tevye has personal conversations with God asking for favours, like a new horse for his milk cart, or for explanations of the changes that are occurring. We hear his thoughts aloud as he weighs the pro and cons of allowing or disallowing his daughters’ behaviour. In 2000 under Susan Schulman’s direction Brent Carver made these conversations and mediations sound like episodes of one long conversation with God by a humble man who simply desires some insight into the ways of the Almighty. In 2013 under Donna Feore’s direction Scott Wentworth treats the same speeches as isolated outbursts, often filled more with anger and irritation than humility, that arise in connection to specific events but are otherwise disconnected from each other. The result is a far less clear and compelling portrait of Tevye’s personality. To make things worse, Feore encourages Wentworth’s use of shtick so that Tevye almost appears like a vaudeville comedian. Mugging, pat gestures, imitation of others in singsong tones may get laughs but they tend to demean Tevye as a character. Carver’s approach made him the emotional centre of the show. With Wentworth, there’s a versatile central showman but no emotional core. The problem of the 2000 production was Debra Hanson’s inappropriately grandiose design with a revolve painted in Chagall motifs and peasants clad in apparently brand-new clothes. Feore, at least, has asked for a design much more in keeping with the subject matter. Allan Moyer’s set is constructed out of what seems to be the same plain, weathered wood except for some references to folk architecture in the carved balustrade of the balcony. Moyer does add non-naturalistic elements to the scene. The miniature peasant houses that often dot the stage help suggest the sense of community so important in this musical. On the other hand, his collect of sculptures inspired by images from Chagall hanging near the stage ceiling look rather more like a jumble of piñatas than a reflection of folklore. Dana Osborne’s costumes are all in earth tones, except for the black garb of the rabbi and his son or the red of the town Constable’s ribbons. Unlike Hanson, Osborne has carefully broken down the peasants’ costumes so that they all look as if they have been worn for years. Unlike many designers of costumes for the common folk, she has even seen to it that the peasants’ shoes are scuffed. This gives a much stronger ring of authenticity to the entire show. Her one failing is in the sequence of “Tevye’s Dream”, where her attempt to give the peasants dream-distorted masks tends to make them look like zombies. Where Susan H. Schulman surrounding Carver's Tevye with a cast of caricatures, Feore makes sure that we see the people of Anatevka as real, complex people. Her one lapse is in Gabrielle Jones’s portrayal of Yente the matchmaker. For unknown reasons she, alone among the peasants, speaks in a heavy accent. The Russian characters have accents, not especially well done, but Yente is a born-and-bred Anatevkan so her accent makes no sense. Luckily, all the other peasants are well conceived. Kate Hennig is a strong, no-nonsense Golde, who is genuinely surprised when Tevye tries to cut through her matter-of-fact manner to find out if she loves him in what is probably the emotional highlight of the show. But then she has always let us sense that beneath her emphasis on work and practicality lays a deep love for all her family. The roles of Tevye's three principal daughters are beautifully acted and sung – with Jennifer Stewart as Tzeitel, Jacquelyn French as Hodel and Keely Hutton as Chava. Of the three French’s performance is the most compelling as she carefully charts the arc of Hodel’s feelings to her tutor Perchik from indifference to amused fascination to self-sacrificing support. As their future spouses, André Morin could afford to give the comically shy tailor, Motel, more character. Mike Nadajewski makes Perchik the tutor such a strong presence that the show loses some of its vitality when he departs. Paul Nolan, though not much a master of a Russian accent, makes the Russian’s love for Chava compelling which helps to make her reciprocation of the love, despite sanctions against it, completely believable. Steve Ross gives a fine portrait of Lazar the butcher, whose joy at the prospect of marrying Tzeitel rapidly turns to rage when Tevye reneges on their contract. Brad Rudy makes us feel that the Russian Constable’s dilemma is real in having to enforce an imperial edict against people who have become his friends. Feore’s choreography is full of excitement in her recreation of Jerome Robbins's original choreography featuring the most acrobatic Russian dances and such displays of skill as the famous "Bottle Dance" of Act 1. I was glad to see that Feore pursued a policy of colour-blind casting at least for the villagers of Anatevka. If she had a more forceful vision she could have pursued this policy for the major roles too. After all, one reason why Fiddler has remained so successful since 1964 is the universality of its themes. Jewish people may have suffered pogroms in Tsarist Russia, but people from a whole range of nations around the world have suffered similar pogroms since. And, of course, there is hardly any religious community that hasn’t had to deal with the effects of change on their traditions. Even if Wentworth’s performance is not as consistent and moving as Carver’s was, the entire rest of the production is admirably sound and highly recommendable. If you are hoping to see a fine musical at Stratford, this is your best bet. Photo: (top) Scott Wentworth (centre) and cast of Fiddler on the Roof; (middle) Kate Hennig and Jennifer Stewart. ©2013 Cylla von Tiedemann.